Potatoes and Cheese. Almost nothing beats this combination. Layer with cream and sauteed onions, and we have magic. These individual potato gratins are the creation of the delicious Stacey Snacks. A favorite food blog of mine for inventive, yet speedy meals. She might have solved my dilemma of making big potato casseroles and wanting to eat the entire thing in one sitting. 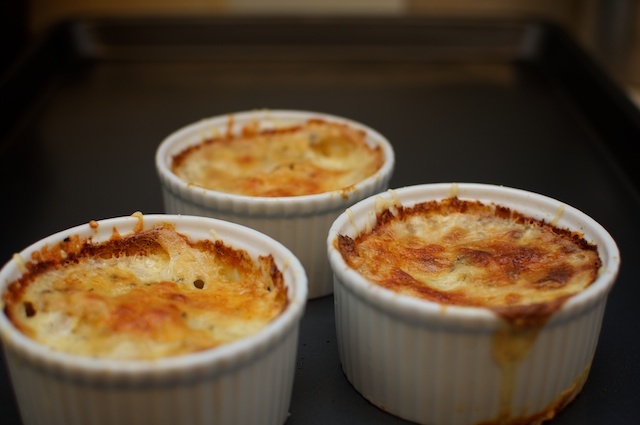 These individual ramekins look pretty on the plate and let each person enjoy their very own, personal gratin! Saute slices of onion in olive oil with salt, pepper and some dried herbs (thyme, oregano or parsley, etc.) for 4 minutes or until onion is softened. Slice potatoes (skin on) with mandolin or sharp knife as thinly as you can. Butter individual ramekins, and layer potatoes, onions and shredded cheese in as many layers as will fit. Top with a layer of cheese. Add another sprinkle of salt and moisten with a drizzle of cream or milk. Place ramekins on a cookie sheet and cover with foil. Bake at 375 for 30 minutes, then remove foil and bake for an additional 10 minutes.